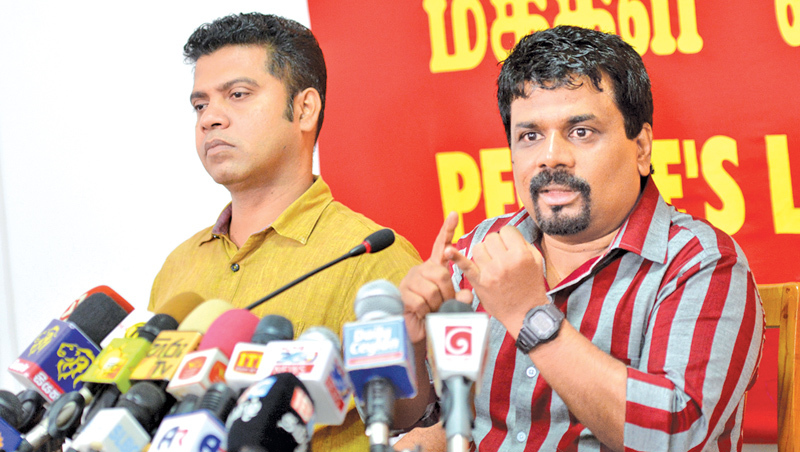 JVP Leader Anura Kumara Dissanayake, stating that his party would vote in favour of the No-Confidence Motion against Health Minister Dr Rajitha Senaratne, insisted that changing ministerial portfolios would not be the answer to the problems cropped up in the country today. He was addressing the media at the JVP headquarters in Battaramulla yesterday. MP Dissanayake pointed out that the failure lies in the socio-economic system and not in the Government or its ministers. “Changing Cabinet ministers like musical chairs will hardly serve the purpose. The country’s current state of affairs reflects the failure of our socio-economic policies. We stand for a change in our economic policy. As a short term measure, we are supporting the NCM against Minister Senaratne,” he said. The JVP Leader said Minister Senaratne should not meddle with the issue of SAITM as his daughter-in-law was studying at the SAITM. “The minister has a conflict of interest when it comes to the SAITM. He is not suited to hold that ministerial portfolio because of the host of other charges levelled against him. The pertinent question is whether it is only him. Almost all the other ministers too have multiple allegations,” he said. MP Dissanayake emphasized the need to present the National Audit Bill in the House to empower the Auditor General to fight against waste, corruption and fraud. Without Ratu sahodarayas this country can be more prosperous and will be a better place to live.